It turns out $30,000 worth of Nikon DSLR camera equipment can do a lot more than take beautiful photos. It can also create beautiful music. 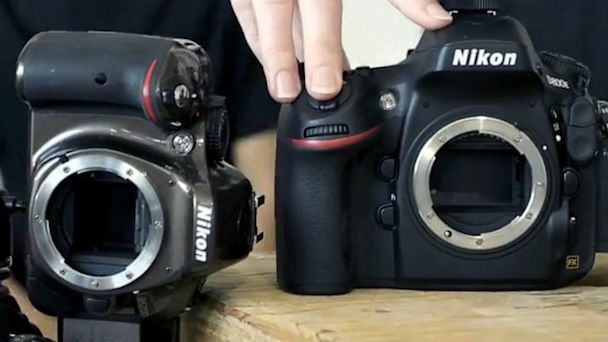 Benjamin Von Wong, a 26-year-old professional freelance photographer in Canada, had an idea after seeing a Canon shutter sound video back in May and after recently visiting Nikon's Special Services team in Toronto. "I had the idea of taking it one step further and composing a piece," Von Wong told ABC News. He gave his friend Andrew Kesler, a composer and recording engineer, a call and the two got to planning. The result is the YouTube video below. In the 50-second track, which has been viewed over 200,000 times, the two used $30,000 worth of camera equipment lent to them by Nikon, including 12 DSLR cameras, to create a composition of shutter clicks and other camera sounds. "We tried to get as creative as possible and figure out how many sounds the cameras could make," Von Wong said. In addition to the shutter clicks and slamming a Nikon D3 on the table, they also draw on menu beeps. The Canon video, which was posted in May, only contains shutter sounds. Kesler and Von Wong gathered 10 other people to shoot the clip at a studio, which is owned by Von Wong's agent. Kesler was the only musically inclined individual, Von Wong explained. The band has disbanded for now, but it might not be the last you've heard from the Nikon Symphony. "The feedback has been so amazing. I think we would love to see how far we can take this," he said. "Andrew and I have already started planning next steps."